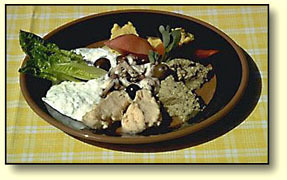 Souvalki is the mainstay of Greek cuisine. 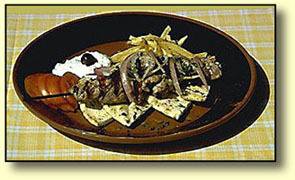 It consists of a skewer of fresh meat that is served with grilled pita bread, tzatziki, fresh tomatoes, onions and fried potatoes. The classic Greek salad always goes well with any dish. Some restaurants may also offer more exotic salads like the one shown here (right).